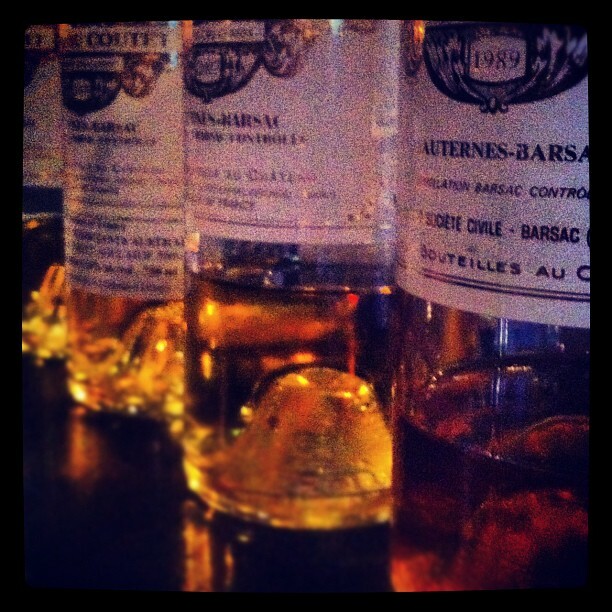 A week or two ago, Sommeliers Australia played host to Aline Baly, third generation owner of the first growth Sauternes house, Château Coutet. The tasting was held at Press* Food & Wine and we were treated to a vertical tasting of four Château Coutet vintages along with some food from Press*. Conditions were slightly challenging at the start as we were seated in the restaurant with a rather boisterous table next to us but mid-way through we were able to move to the cosy booths by the bar – which actually proved ideal. Aline was lovely – she came across as being incredibly genuine, as well as both knowledgeable and passionate about her family’s product. While there are 11 premiers crus in Sauternes and Barsac, Ch Coutet is one of just two in Barsac (the other being Ch Climens). Aline described the difference between Sauternes and Barsac as being one of terroir: the clay and limestone soils of Barsac mean it has a cooler terroir than in Sauternes, where there is more gravel. The gravel captures the heat of the day and releases it in the evening, which keeps the grapes warmer and means that the wines produced tend to be more opulent. The wines of Barsac, on the otherhand, are characterised by crispness, freshness and vivacity. We tasted the four vintages in order of ‘power’: 2006, 2005, 2007, 1989. Aline told us that Ch Coutet is characterised by ginger, which I didn’t really get at all in the 2006, but it was much more evident in the ’05 and ’07 (the ’07 was my personal favourite). The 2007 had the spice and ginger but also some floral notes and on the palate had amazing acidity, combined with spice, toasted nuts, honey, dried apricots, lime marmalade and even some savoury notes. Food wise we had gougères*, pâté, croquettes and wrapped up with crème brûlée, which was served with the 1989. The pâté was definitely the best match – unsurprising when Barsac and foie gras is one of the world’s great food pairings! The gougères worked well too but the croquettes were too dominated by Dijon mustard. The crème brûlée, which on paper sounds like a brilliant match, didn’t work so well because it was simply too sweet and rich for the wine. This is always the conundrum with desserts – whatever wine you choose has to be bigger, sweeter, richer, more powerful than the food and with many desserts that is a real challenge. Château Coutet is available from the Edinburgh Cellars and Dan Murphys. UPDATE: read an interview with Aline at Decanter. *They were described as gougères but as they were fried I’d have called them beignets. This is an especially good review, Alex. Well worth the effort!